We are pleased to inform you that the Beta 10.12 of CSHTML5 is available for download! Note: This is a pre-release build of the upcoming Beta 11. POLL: Vote for the feature(s) that you like the most in the upcoming Beta 11! Much improved HtmlPresenter control, now supports direct content! It lets you very easily place custom HTML code inside your XAML. See an example and the documentation here. Improved the XAML Inspector (in the Simulator) so that it is possible to enter multiple lines in properties of type "string"
Thanks for releasing the new version. When to support vs2017? After testing, vs2017 xaml editor is really very easy to use. In addition, we really need several good-looking themes. (Like silverlight toolkit theme). Can I provide it in beta 11? Thank you! ListBox SelectedItem Background Colors appear broken in this build. I can't get even a simple Listbox to show me the system-default background colors when selecting an item. The Items instead allow me to select their text as if they were a Listbox. It doesn't seem to matter if I set the SelectedItemBackground property or not, selecting an item from the Listbox no longer changes its background color. Combobox selected Item colors still work. Seems to just be a ListBox issue. TaterJuice wrote: ListBox SelectedItem Background Colors appear broken in this build. 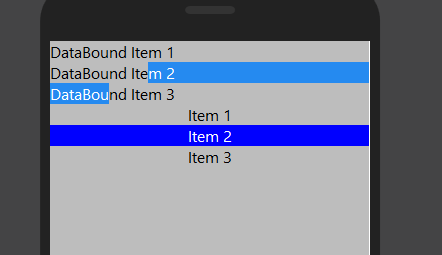 I can't get even a simple Listbox to show me the system-default background colors when selecting an item. The Items instead allow me to select their text as if they were a Listbox. 1. Create a new project of type C#/XAML for HTML5 "Sample - Controls Showcase"
3. Run the project, click "OK", click "Controls", and test the ListBox: as you can see, when you select an item, its background changes. Can you please tell me if the steps above produce the same result on your computer, and how to modify the steps above to reproduce your issue? Thanks for the quick reply. I tested with the sample application and it worked. I've found the issue presents itself only when binding to the ListBox's ItemsSource property. When Binding to the ItemsSource, the ListBox lets me select the actual text of the items, instead of selecting an actual item. I've included a screenshot, and a sample application for you to test. It looks like its rendering differently when using a databinding. I've also tried using the Tapped event on a child element to set the ListBox.SelectedItem in code-behind, and it does set the selected item (I can see it in Intellisense) but it still fails to draw the background color. PS. This is not an issue with the current public release available from your main site. In my ViewModel, if I change my ObservableCollection<String> to an ObservableCollection<ListBoxItem>, it works. It looks like the DataBound collection is not rendering the ListBoxItems appropriately. Switching back to ObservableCollection<string>, I've tried using the ListBox.ItemTemplate to wrap the items in <ListBoxItem> tags in XAML, but that fails to display the background color again. Thank you TaterJuice for the details. The issue has now been fixed in Beta 11.0, which will be released before the end of this week.